Brilliant, Ready-To-Use Colors. 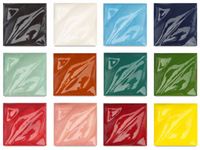 Amaco® Liquid Underglaze Decorating Colors are supplied in time-saving, ready-to-use form. 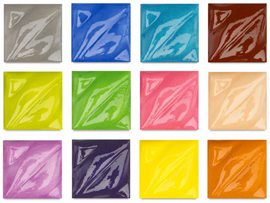 The concentrated, opaque colors are recommended for covering large areas quickly, easily, and smoothly. Results are equally effective when the colors are used for detailed painting, sgraffito decoration, watercolor effects, free brush painting, wax resists and mishima decoration. Many colors are good to Cone 6 and higher. 25 intense colors are available and other colors, shades and tints are made by blending. The colors may be brushed: (1) on greenware which is to be bisque fired before applying a covering glaze or (2) on bisque, then covering glaze applied. For opaque coverage by brushing, the consistency of the color in the jar is correct. Slip may be tinted by adding small amounts of GUG to produce colored slip. Intensity depends on quantity used. To color moist clay, cut clay in very thin slices, pour GUG color between slices and wedge until uniform color is achieved. Set #812 shown at left: Warm Gray, Medium Blue, Turquoise, Mahogany Brown, Chartreuse, Warm Green, Pink, Suntan, Lilac, Purple, Bright Yellow, Orange. Set #712 shown below: Black, White, Light Blue, Dark Blue, Aqua, Light Brown, Blue Green, Dark Green, Rose, Peach, Maroon, Light Yellow.